The data released in NCHS Data Brief 325 (November 2018) do not, unfortunately describe the breadth of use in past surveys. The NCCIH merely offers this quizzical note, since yoga and chiropractic, at least, are central to this report: “Previous surveys were broader and included substantially more questions while the 2017 survey focused on the use complementary practices not included in other large national surveys, such as massage, yoga, and chiropractic.” Chiropractic showed a bump from 9% to 10%. There is nothing on acupuncture or massage, for instance. This initial report has its additional frustrations. The study, led by the CDC’s Tainya Clarke, PhD, MPH and anchored by NCCIH’s lead epidemiologist Richard Nahin, PhD, MPH, doesn’t give a gross percent of US adults who used any type or practitioner, or practice. We don’t have a present comparator with the 42% using CAM figure that the 2012 publication reported. To understand what may yet be coming, I opened the file of the CDC’s entire National Health Information Survey. Pages 222-230 are devoted to the “CAM” questions with which NCCIH was involved. They give a taste of what is yet to come. The survey also asked questions relative to use of naturopathy, chelation, homeopathy, progressive relaxation, guided imagery, spiritual meditation, centering meditation, mindfulness meditation, Qi gong, and traditional medicine use. We’ll have to wait for these. The other intriguing area is a repeated question sequence relating to Tai-Chji, Qi Gong and Yoga. Respondents are explicitly asked if the physical practice involved with each was connected to first, breathing exercises, and second, meditation. In short, were these whole person health practices or merely stretching? Unfortunately, the questions fail to address a deficiency in the NCCIH perspective that emerged two surveys ago. The questions ask, for instance, “did you practice Qi Gong (chee-GONG) for yourself?” I add the italics. In the focus on self-care – a good trend- they obscure the perhaps important role of the yoga instructor, the credentialed yoga therapist, or the Tai-Chi or Qi-Gong master. Regardless of intention, this perspective supports an unfortunate trait in US integration in which the mainstream often treats “CAM” as a thing – a modality or therapy. This diminishes the important role of the human being, whether practitioner, instructor, master or licensed clinician. Use of meditation was similar across three age categories, at 15.9% for those 45-64 and 13.4% for those either younger or older. 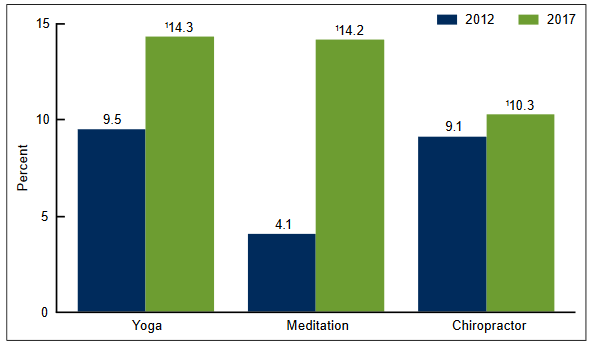 Significant increases were seen in children’s use of yoga and meditation with basically no change in their use of a chiropractic. Perhaps the other reason for the gripe in the NCCIH focusing on yoga/meditation/Tai-Chi/Qi Gong as self care is that this misses not only the practitioner but also the community, group-delivered services component, and the ritual of attending classes. For a people who rarely gather with others in institutional churches, these breathing plus meditation plus movement plus community practices may be providing some of the connective tissue for creating a new sort of relational fabric. Not surprisingly, the NCCIH-CDC research team did not opine on whether there is any evidence here that the world itself is somehow knitting itself together through these re-constitutive practices.